I admit it. This bag surprised me. I expected a perfectly normal average duffel – yes, it’s true, sometimes I can be a tad cynical – but I have been humbled. Call me jaded, but I sometimes think I’ve seen one bag, I’ve seen them all. How different can a duffel be? Honestly, really, not THAT different, but in the case of the Sundown, just different enough. I took it on an overnight jaunt to see a friend in another town, and needed to pack for an urban adventure day, a fancy dinner, and a business meeting the following morning. I admittedly didn’t cram my business suit into the bag – I hung it up in my car like a civilized person – but everything else went into the Sundown. And you know how you always pack just a little bit heavier when you are traveling by car? I didn’t pack the kitchen sink or anything, but I saw no reason to skimp on the essentials; I had an entire station wagon at my disposal. Still, you know what? Everything fit in the bag. I didn’t have to throw things into the backseat willy-nilly; for once I traveled with everything ensconced in a single bag. I arrived with one bag in hand, looking all cool and collected and organized. And then I come onto the site and admit that it was all just an illusion…I sacrifice for my art, what can I say? The Sundown has a nice roomy main compartment, but the real highlight are the side pockets. There are two outside and three inside, and they fit TONS of stuff. They’re like black holes; you can just keep putting stuff in there and it all somehow fits. And no matter how much you jam into the pockets, the rest of the bag doesn’t bulge out of shape at all. It’s got the now-ubiquitous vented shoe pocket to keep your footwear away from your clothes, and it’s easy to carry thanks to the integrated handle. This, to me, is the best feature. 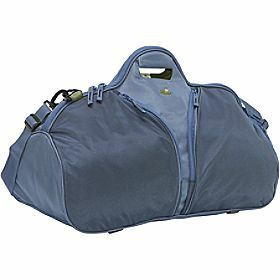 Most duffel bags have a shoulder strap and two handle straps that always manage to be difficult to use – and that velcro wrap-thing that can be used to tie the two handles together? Ugh. The Sundown is different; the handle is built into the bag so that as soon as you zip it closed, you’ve got a handle. No more dangling your bag awkwardly from one strap. Cleverly, the handle also serves as a vent so your stinky clothes have a chance to air out. This does leave basically a hole, but unless you’re leaving your bag out in the rain or setting it on an anthill, it will be OK. The Sundown is a great overnight bag but could easily serve as a gym bag, though I find it a tad big for that. It’s really more than just an ordinary bag, and it takes a lot to get that statement from me, as you know if you’ve been a longtime reader. I didn’t think a bag could surprise me – but luckily, life is full of surprises!